Characterize and predict atmospheric conditions to support your weather-sensitive projects. STI's team of meteorologists has experience with meteorological forecasting measurements, modeling, instrument audits, and real-time weather network operation. Gather higher-resolution data to better understand and characterize atmospheric conditions to support meteorological forecasting for a variety of air quality, renewable energy, transportation, and emergency response applications. Optimize your network to gather meaningful data in a cost-effective manner. Leverage STI's expertise to manage your instrument networks with routine maintenance, instrument repairs, calibrations, audits, and data processing and management. 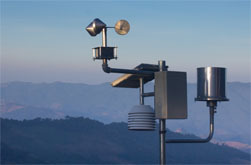 Save money by leasing meteorological instruments, including radar wind profilers, ceilometers, sodars, microwave radiometers, and traditional surface meteorological stations. STI's instrument experts will help you through every step of your project. Ensure high-quality data and high data recovery rates with routine audit and calibrations of meteorological instruments. Schedule, log, and track your monitoring network in one place with eSIMS, the electronic logbook for modern air quality monitoring. eSIMS provides secure, redundant assess to your information from anywhere, on any device. Use our customized operational forecast models to predict weather conditions for timely decision making. Support your air quality management with case study modeling, and identify meteorological conditions that influence emission control strategies, source receptor relationships, and long-range pollutant transport. Better understand the atmospheric processes that affect your area and how these processes influence the transport and dispersion of air pollutants on a local-to-regional scale. Effectively manage your meteorological data with a customized software solution. STI develops, manages, and enhances software tools, decision support systems, and applications that are customized to meet our clients' scientific goals. Engage and inform the public with informative, vivid websites and graphics using a custom content management system. Use decision support software to facilitate air quality management planning. Reach a larger audience with environmental information anywhere, at any time, on any device.